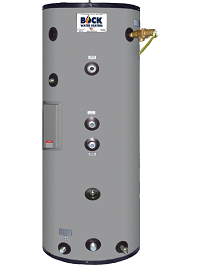 Two-coil indirect water heater is ideal for combination Domestic Hot Water and space-heating applications, or, use both coils in parallel to boost 1st hour performance up to 45% @ 200°F coil output. Single-wall full throat 1-1/2” diameter coil heat exchangers – upper and lower. 73 gallon and 108 gallon actual capacities. Standard 6 year residential tank and heat exchanger warranty; 3 year commercial warranty. 50SKE, 80SKE, 80SKDCE, 119SKE and 119SKDCE Models have 4500W electric heating element for supplemental heating when appliance is installed as solar-thermal water heater.